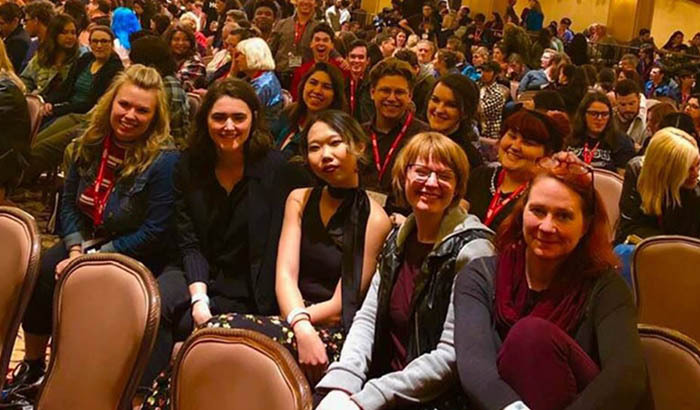 Networking, scholarships and recognition were just a few things students part of Grand Canyon University’s Theater Department took away from this year’s Kennedy Center American College Theater Festival (KCACTF) in Los Angeles. Students were nominated in multiple categories to compete in the Kennedy Center competition. Tu “J” Nguyen (left) and Keeli Rodriguez (Right) celebrated Nguyen’s second in the region victory for her property design. The KCACTF is a competition in which universities from all over the nation have their pieces selected by judges and are able to compete with other students from around their regions. GCU has not been in the KCACTF game long, but that hasn’t impeded their progress. Three of GCU’s nominated students advanced to the semifinals of their respective competitions, and two finished second. Tu “J” Nguyen, who earned second place in the region for her property design for “Peter and the Starcatcher,” is no stranger to the festival. She placed first while attending another college last year. 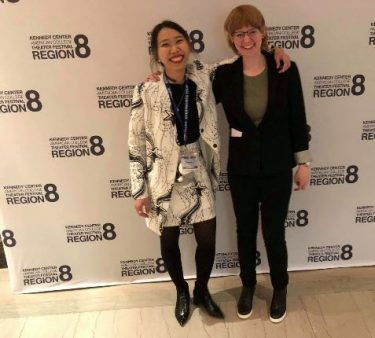 “Last year was actually my first year actually participating in the competition and it was my first time ever designing anything, so to actually win first place was really overwhelming and it makes me want to do better this time,” Nguyen said. She wasn’t too upset placing second this year. “I did my best,” she said. Rachel Schumacher, who placed second in the region for her lighting design for “Peter and the Starcatcher,” was a first-time designer for this year’s festival. That also earned her a one-week scholarship (later upgraded to two weeks) to the Stagecraft Institute in Las Vegas. Mandy Tompkins made it into the semifinals in the stage management category. She said the experience was enough to “fuel” her until next year, when she hopes she’s able to compete again. 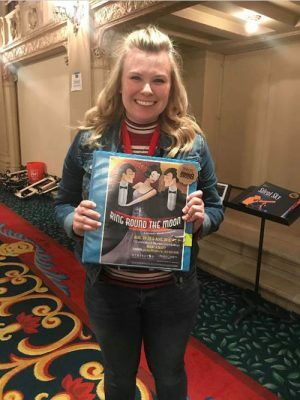 After advancing to the semifinals for her stage management of “Ring Round the Moon,” Mandy Tompkins was shocked to find out how impressive her work was to the judges. The trip gave Tompkins a new realization of her love for stage managing but was just one of the things she brought back with her. She gained more from the experience than she expected and urges other students pursue their interest. The DTM (design, technology and management) students weren’t the only one’s making waves in their areas of the competition. 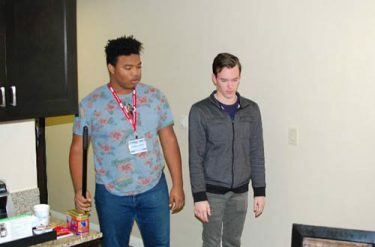 Actors from GCU were sent to compete in the Irene Ryan portion of the competition and for the first time made it to the semifinals. Brandon Brown, who made it to the second round, said that although it was a competition against hundreds of actors from all over the region, everyone helped each other rehearse. Brown and his partner, Christian Bradford, were one of the 60 groups out of about 300 to be selected to move forward. Christian Bradford (left) and Brandon Brown were nominated to compete in the Irene Ryan acting competition and dedicated hours to practicing. Aside from the competition, students got to partake in theater workshops, audition for different projects and enjoy a free day exploring Universal Studios, the Hollywood Walk of Fame and, before it closes its doors permanently this month, the Samuel French Bookstore. Stage manager Kaitlyn Johnson, nominated for her work on “Peter and the Starcatcher,” took advantage of other opportunities the Kennedy Center offered. Students were grateful to the Theater Department for making the trip possible.